Learn how to create your own content in Zunos using our Content Creator. Content Creator gives you control over the different structure elements of your content item. These include the structure, properties and body. The Structure is the skeleton layout for your content, the placement of these containers allows you to more easily manage your content items. 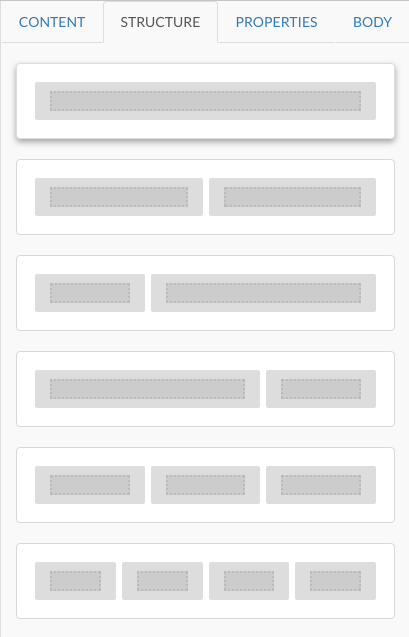 You will find a number of different structure layout options to choose from to help create your content layout. Choose your layout by clicking and dragging it onto the canvas in the left hand pane. When the structure item is about to lock into place, you will see a faint drag it here notice appear. At this moment let go of the dragged structure item. Continue to repeat steps 1 and 2, to build our your content structure. Tip: We recommend as a best practice to continually save your work! The Properties area allows you to manipulate the row and column properties. Choose your row background colour, either clicking on the color swatch or entering the web color code. Choose your Column properties, depending on the number of columns you have created you will see your columns in individual tabs. 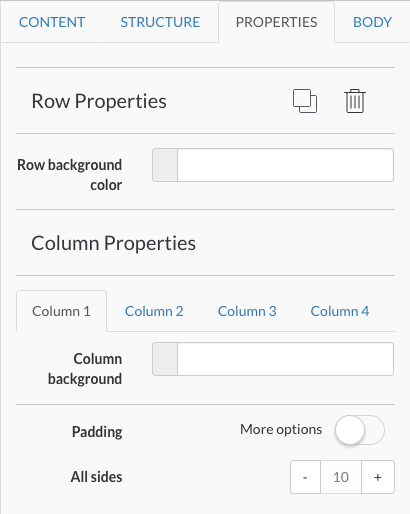 Choose your Column background color, either clicking on the color swatch or entering the web color code. Manipulate the Image padding for either all sides or enable More Options to select individual sides to manipulate. The Body provides the overall body settings. The first option is Content Width, this can be either set to auto or disabled to set manually and expand or minimize the width of your content page. 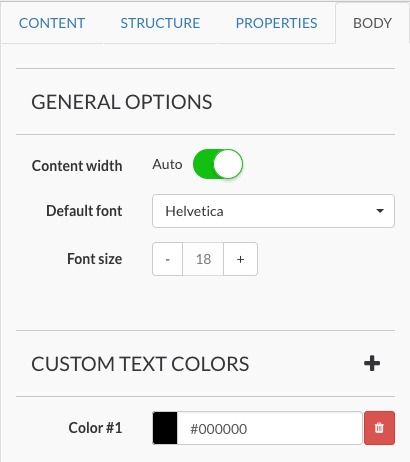 Finally you can create multiple custom text colors and set the custom text colors, either clicking on the color swatch or entering the web color code.